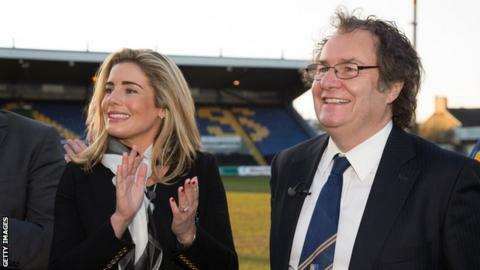 Football is “full of dinosaurs” says Mansfield Town chief Carolyn Radford, who claims she is patronised by other clubs’ executives “all the time”. Radford, whose husband John is the club’s chairman, says her appearance is often commented on in boardrooms. “My points are equally valid,” she said. Speaking to BBC Radio 5 live’s Wake Up To Money, Business of Sport, Radford says she has had to learn to let such remarks go “over her head”. She said: “I just think, ‘OK, it’s their problem, not mine’. But equally, is it preventing other women from getting involved in the sport, in the fact that I’m not standing up and saying actively: ‘No, this isn’t good enough’? “If I go into a boardroom, a lot of the time I’ll be talking to other chairmen of other football clubs or other executives at a high level and they’ll choose to just smile if I say anything, and talk to my husband. Radford believes recent social media campaigns encouraging women to speak out about sexual harassment and abuse – such as the #MeToo campaign in the US – have made a difference. “People are calling it out and saying it’s not acceptable,” she said.